Eight years ago the Devil himself came to London to dwell in Carfax Abbey. Eight years ago my dear friend Lucy became one of the Un-Dead, and my own soul was cast into peril by the pernicious Count Dracula. Eight years ago Quincey Morris, your namesake, gave his life to see that evil destroyed. Would that his sacrifice had not been in vain. My dreams have been troubled, my sleep disturbed by visions of a castle in the Carpathian Mountains. I see a carriage with four black horses and smell the salt of the sea, and the awful tang of blood. I wrote to Professor Van Helsing at once when the dreams began, and he confirmed my fears: the Count is returned. As the dreams continued, I awoke one night to find myself standing in the hall with Mr Morris's old knife in one hand. I knew not what mischief I might have wrought had I not awoken when I did, nor did I have any longing to learn. I packed my things, kissed you and Jonathan good-bye, and departed that morning to visit Arthur-Lord Godalming-in the country. Doctor Seward and Van Helsing arrived soon after, and we hunters of the Vampire were thus reunited. Only Jonathan remained, staying with you, my son, to keep you safe. My son, we do not know where Dracula makes his lair, nor do we know his ultimate goal, except that it is evil and a grave peril to all the world. He lives despite our efforts, and his revenge will be terrible indeed. Jonathan's instructions are to give you this letter in the event of my death, when you are old enough. I hope that you never read these words. I hope that I will come home to you. But I fear that none of us may survive the fury of Dracula. This edition features all-new art and graphic design crafted to complement the game's intuitive, thematic mechanics. Rounds are now broken into day and night: hunters take actions during both, but Dracula can only act at night. Combat is now more streamlined and decisive, and new rumor tokens allow Dracula to mislead hunters and extend the terrible reach of his influence. Count Dracula triumphs if he advances his influence track to thirteen; if the hunters can defeat him before then, they save the continent of Europe and win the game. Fury of Dracula is a one-versus-many deduction game inspired by Bram Stoker's classic novel Dracula. 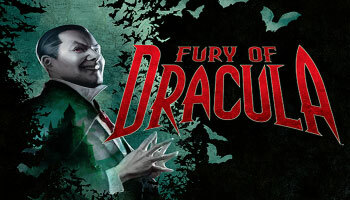 One player controls Dracula, and up to four players assume roles as hunters. 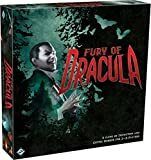 During the game, Dracula attempts to elude the hunters as he spawns new vampires across Europe, while the hunters try to find and destroy Dracula and end his reign of terror. 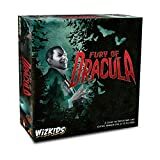 This section provides additional rules required to play Fury of Dracula. For further clarifications or specific game effect interactions not covered here, see the Rules Reference. During the hunter phase, dawn occurs before day and dusk occurs before night. During dawn and dusk, players advance time and then fight Dracula if he is revealed. After players play their first game, they should use the following additional rules. These rules add depth to playing as Dracula, allowing him to have more locations with encounters than just the six spaces of the trail, providing him with access to the five power cards, and introducing rumor tokens which can mislead the hunters or increase Dracula's influence.